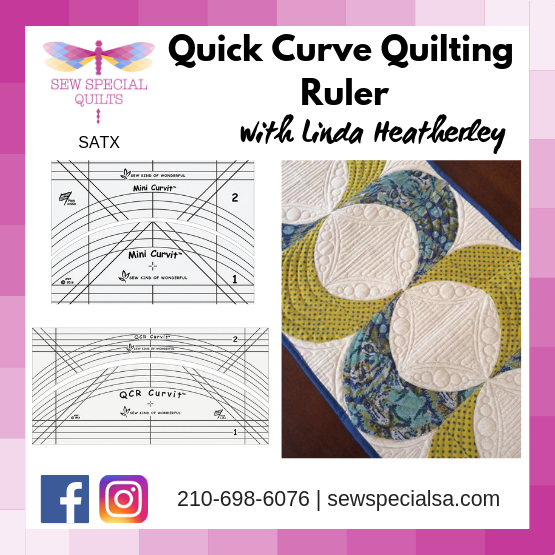 Join Linda Heatherley (quilter and QCR maker extraordinaire) as she shows you how to use the Sew Kind of Wonderful Curvit Quilting Ruler. This quilting ruler is just the right curve for ALL the Quick Curve rulers. Grab your unquilted Quick Curve top and come use one of the Curvit Rulers to quilt it. If you don't have a top the Quick Curve Ruler does come with a FREE pattern. Supplies Needed: 15% Off all items needed for class. 1. Sewing machine in good working order. Oiled and with a new size 80 needle. 2. 50 weight thread in the bobbin and top thread. 3. Curvit Ruler (Choose between either the mini or the large) that corresponds with your UNquilted top. 4. Ruler Foot for your machine. 7. Slide on table if your machine comes with one. 8. 12" square quilt sandwich for practice. 10. Unquilted Quick Curve top. A completed Quick Curve Ruler top.